Katrina and I took a much-needed vacation and spent the last week down on St. Croix in the Caribbean. I have to say, this is the best time of year to vacation down there. It’s off-season, so very few tourists were around and that made the trip much more enjoyable. St. Croix doesn’t get as many tourists as the other U.S. Virgin Islands (St. Thomas and St. John) to begin with. No crowds to compete with at the beach, traffic wasn’t an issue, and overall everything was much more relaxed. We stayed at a resort that was right on the ocean, and our room happened to be on the first floor. We were able to walk off our back patio onto the sand, and it was gorgeous. Nothing beats reading on a hammock tied to two palm trees, snorkeling was just a short walk away, and the island is small enough that nothing is too far by car. Down there they drive on the left side of the road, which took some getting used to, but after a day or two it was second nature. Logtar interviews Dan Lacher: The weekend before we left, Logtar interviewed Dan Lacher at the local MiaMUG meeting. I was on the scene to take some pictures, which can be found on my Flickr page. The Podcast itself can be found on Logtar’s blog. Happy Apps releases WebnoteHappy 1.0: Luis de la Rosa just released his first shareware application. Back in January, Luis released WebnoteHappy Lite, the free version of the app. I mentioned it here back then and all the same things apply for the full version. I gave Luis a quote about the software, and he ended up using it on the product page so that’s pretty cool. WebnoteHappy is a really great bookmark manager, so if you’re looking for something along those lines I would suggest checking it out. If you live in the Midwest, you are probably pretty familiar with all the rain we’ve been getting the past few days. 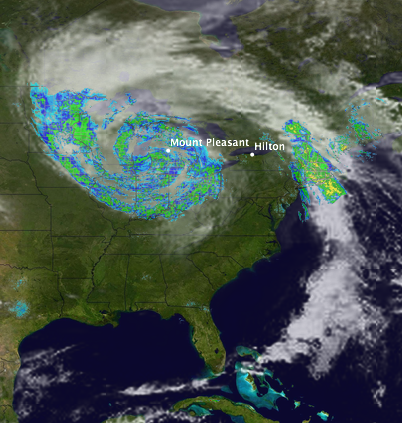 The low pressure system that has formed is one of the largest I’ve seen in quite some time. It’s centered just over Lake Michigan, and you can see clouds extending well up into Canada all the way down the east coast to Florida and the Gulf of Mexico. Yesterday it bottomed out just about 40 miles West of Mt. Pleasant. We had a 983mb pressure reading, which is the lowest pressure we’ve had here since before I started writing Seasonality. 🙂 The interesting thing about this system is that it’s not really moving much at all. Typically, low pressure systems will form to the West of us, and just move on through within a day or two. This one will probably hang around for 5-6 days. It’s centered over Lake Michigan right now, is expected to move down into Illinois and Ohio over the next day or two, and then perhaps come up North again. It’s forecasted to be dropping rain on and off here through the beginning of next week. Here’s a screenshot of the storm in Seasonality. This shot also shows one of the cool new features I’ve added in version 1.3, a full radar image overlay. The National Weather Service started offering a high resolution US map with a composite of all the radar images. Now Seasonality uses that to generate a map, so it makes long-distance viewing much nicer with respect to precipitation. I just wish this feature could extend into Canada to show the rest of this storm (US radar sites reach just north of the US-Canada border as you can see in this image), or the rest of the world for that matter. Seasonality 1.3 is coming along slower than originally expected, but it has several new features. Expect an announcement around the end of this month.